It’s raining constantly here in Hanoi, all day, non-stop. I’m feeling blue. For my nails. Haha. 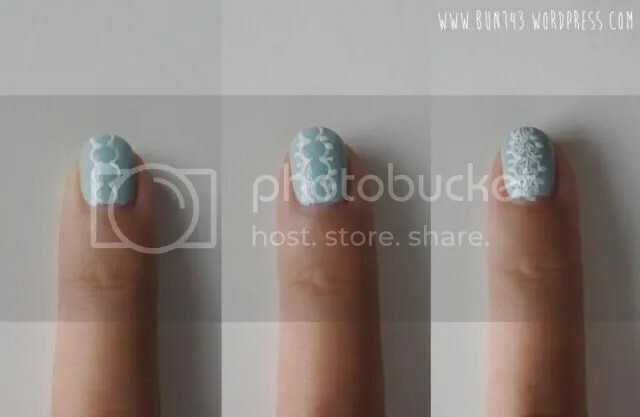 Today I’m going to show you how to create this lacey look for your nails. 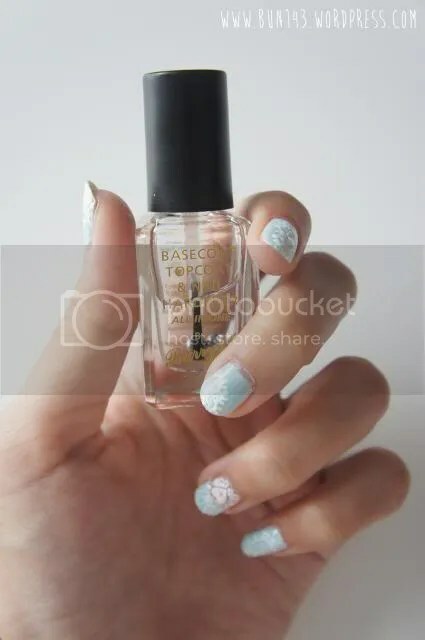 With a gentle powder blue base coat, this nail design gives off a very feminine and elegant feeling; wouldn’t that be perfect to wear to a classy tea party. 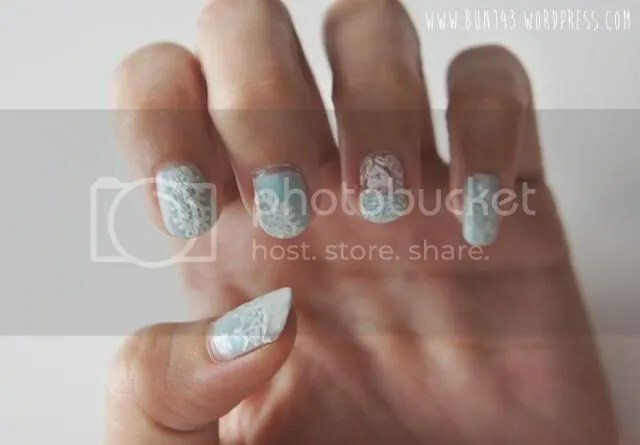 Now that I look at the photos, I think it can be a good bridal nail art design as well! 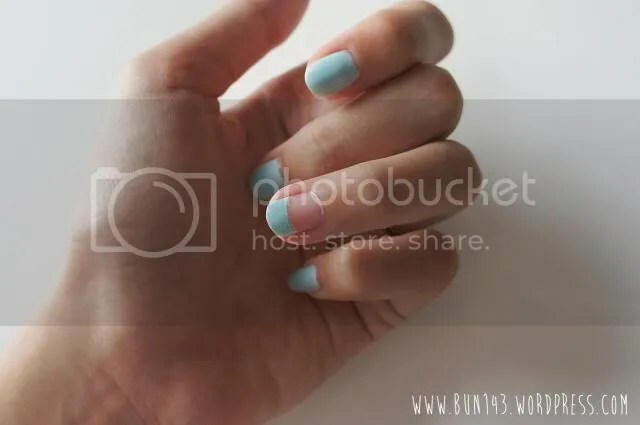 With a baby blue colour, paint your base coat nicely. 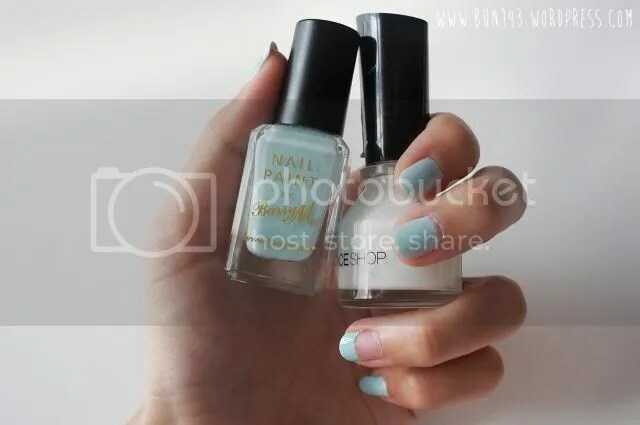 If you have a thin nail polish like mine, I reckon that you use a white base coat before using your blue lacquer, the colour would be more correct. 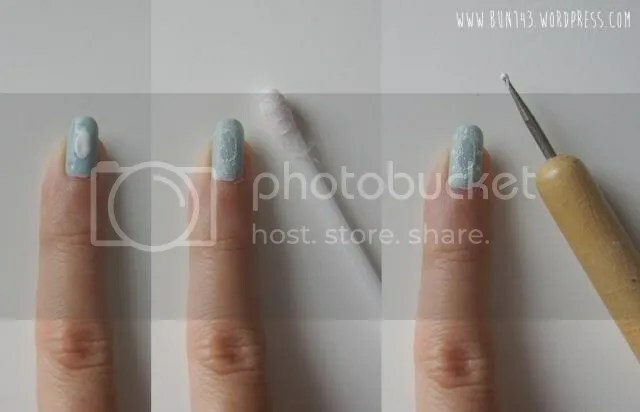 Remember to paint only the tip of the nail for your ring finger. 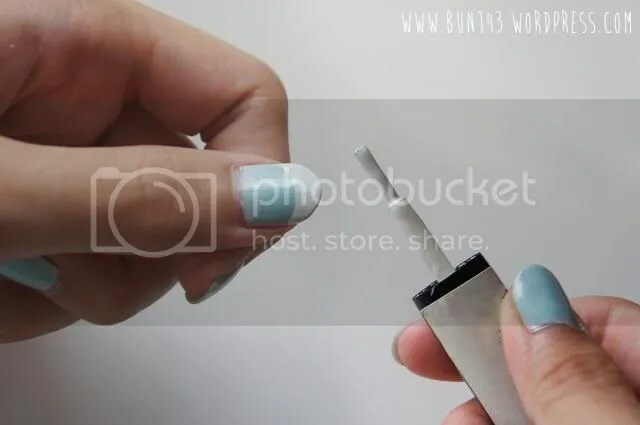 We’ll start with the thumb first: Use your white nail polish and paint the tip of your nail. *Tip: As for the last step, I drew random lines to make it look like lace pattern. 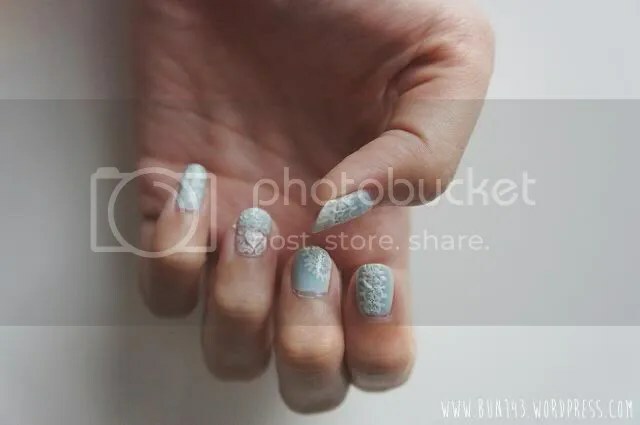 For your index finger, also use a nail art pen to draw the lace. 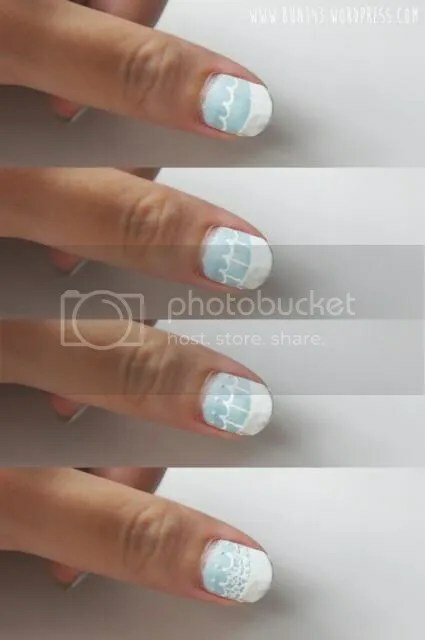 If you don’t have one, you can use a paint brush with fine tip and your white nail polish to draw. Then, for the middle finger, we’ll draw only a doily lace corner. Next is your ring finger. 1. Draw a heart using your pen. 2. Random lines for lace. 3. Use a brush (or the pen) and dots white nail polish randomly around the heart. 4. Wait for it to dry half way (just a few secs), then use a cotton buds and dab to create a lacey effect. 5. Use the tip of a pen to “carve” lines and make it look a bit more like lace. Pinky pinky. 1. Put a big dot of white nail polish in the middle of your nail (it doesn’t have to be perfect). 2. 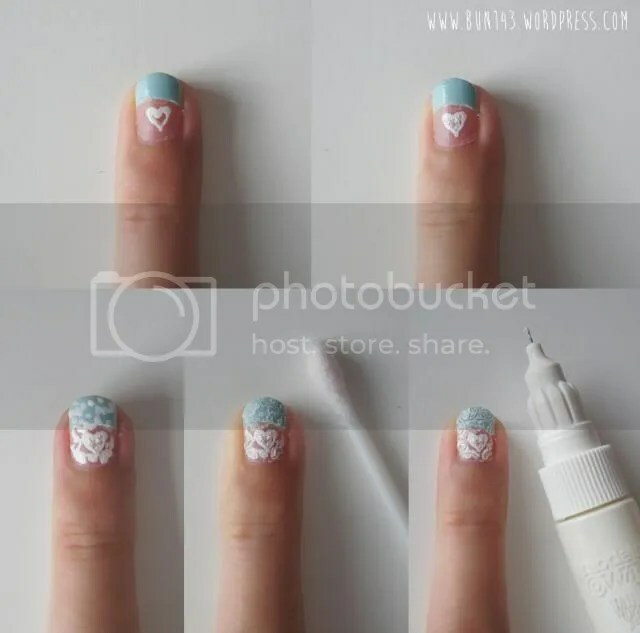 Use a cotton buds and dab to create the lace pattern. 3. Use your dotting tool and dot around. And there you have it, your own elegant lace nail design! 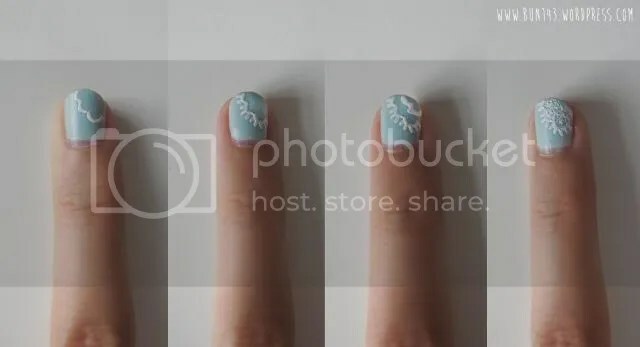 If you want to see more nail art tutorials, click onto the Beauty category :3 If you want to see more in the future, you can follow this blog using WordPress “+Follow” button on the top of the page, or follow via email with the button on the side bar to the right. could you post some more outfit or lookbook entries please? i really look forward to that.